Following lunch, reunion attendees were invited to tour of the new 71st offices and a briefing by Lt. Col. Jim Cardoso. the office tour included the new 71st's Heritage Room. 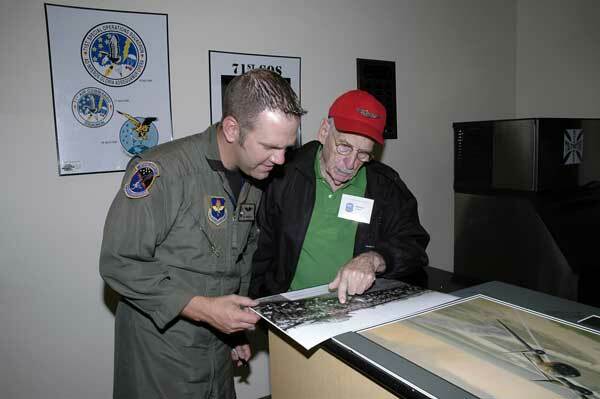 It contained decorations, documents, and photographs depicting the history of the 71st squadron. The star and bars insignia from WW II and the the squadron code of the 71st TCS (CJ) painted on one wall. 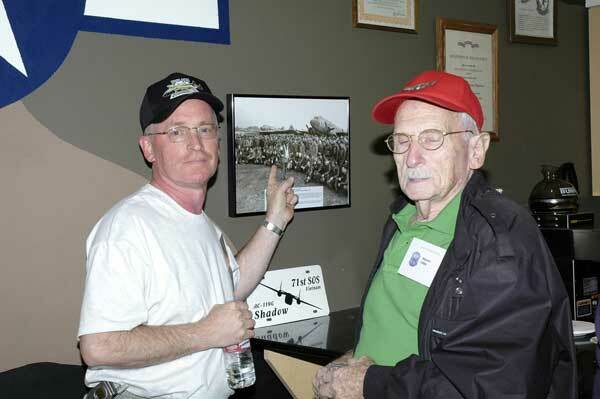 Leroy Frahm (L) and Marvin Litke are poised in front of the WW II wall. The photograph was taken at the home station of the 434th Troop Carrier Group, Aldermaston, England on September 17, 1944. the photo shows B/G Anthony McAuliffe speaking to the flight crews of the 434th TCG prior to operation Market-Garden, the invasion of Holland. Leroy Frahm points to Marvin Litke who is seated on the ground in the front row. 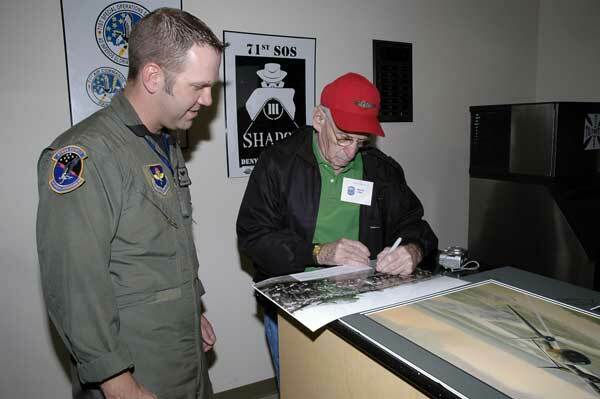 SSgt Darrin Kast removed the 16 x 20 photograph so Marvin Litke could autograph it for posterity. 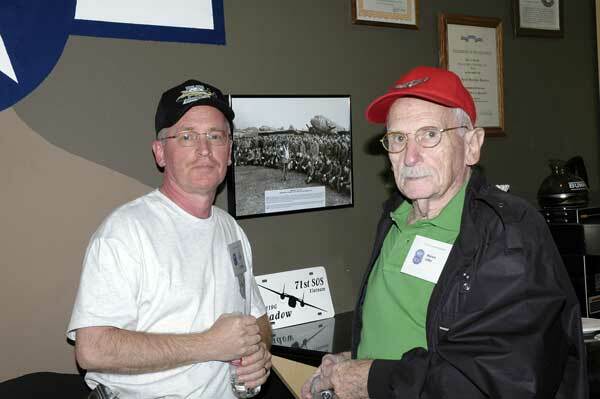 Marvin Litke identifies many of his fellow flight crew members that he flew with during World War II. 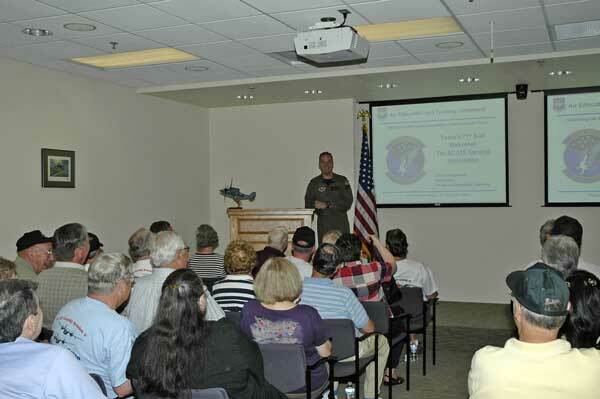 71st SOS Commander Lt. Col. Jim Cardoso conducted a PowerPoint presentation about the mission of the new unit. The briefing was very informative and entertaining.